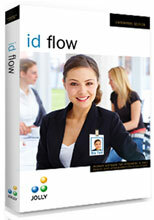 ID Flow is Jolly's industry leading ID software solution for the management and production of secure photo ID cards. As the software of choice for Fortune 500 companies, municipalities, K-12 schools and universities, Jolly is perfect for organizations of all sizes. Built around an advanced record management platform that can integrate with existing HR systems and featuring a powerful card designer and an easy-to-use card production center, ID Flow provides unmatched productivity and flexibility. I was looking for an easy to use ID Software that also could handle different kinds of employees and have different designs for them based on their description. ID Flow makes it easy. I made 3 different designs (contractors, employees and visitors). I could issue these all from the program. Really easy to use. They even had templates that I just changed the colors of to use as my own. The Jolly IF6-STD is also known as IF6-STD	or IF6STD	.